I was taken sick with cholera and we sent for Joseph Smith Senior and John his brother, who said the sickness was not unto death. And when they administered it did not have the desired effect. I suffered such excruciating pain that my groaning was heard at Joseph Smith Junior a distance of 250 yards. I was afterwards told that when in agony I called out “Let Joseph Smith Junior come and lay his hands on me and I shall be healed and I know it,” not knowing what I said. He pressed his way through the crowd for the house was filled with people, and came forward and laying his hands upon my head asked God the Father in the name of Jesus Christ to heal me. The vomiting and purging ceased and I began to amend from that very moment. 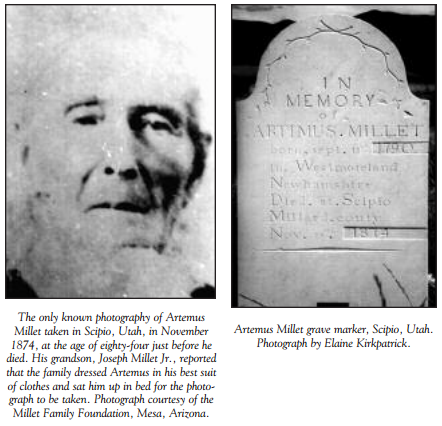 Journal of Artemus Millet Written by Himself, LDS Church Archives, Salt Lake City, Utah. See also: Keith Erickson and Lloyd Newell, The Conversion of Artemus Millet and His Call to Kirtland, BYU Studies Quarterly, Vol. 41, Iss. 2 , Art. 3. This entry was posted in Church History, Miracles, Stories from Church History and tagged Artemus Millet, Joseph Smith, Kirtland, Miracles, priesthood power. Bookmark the permalink.